Rain and mist lashed down out of the darkness as I drove over the Pass of Drumochter in the middle of the night, on my way home from giving a talk on the Arizona Trail to the Air na Creagain Mountaineering Club in Ardrossan a few days ago (an enjoyable evening with friendly people and some unintended extra entertainment when the roof of the bar we were in started leaking). After talking about the heat and light of the desert and showing my slides of the walk, image after image with clear blue skies, hot red and yellow rocks and a sharp clarity to the landscapes, my mind was far from the swirling dampness of a Highland night. I was dreaming of deserts, dreaming of wide open spaces, a harsh sun, bare stony mountains, nights out under vast star filled skies, walking along dusty trails through cacti gardens. 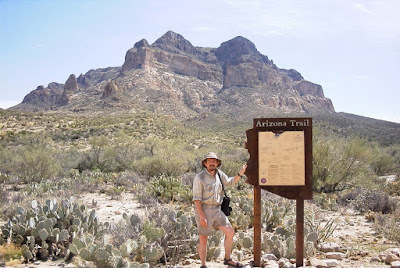 It’s seven years since I walked this trail and I hadn’t thought about the desert since I did a podcast with Andy Howell for the Outdoor Book Club (Book Club No.3) last year about my book on the walk, Crossing Arizona. Reliving my walk I wanted to go back, to walk again in the desert and feel the hot sub beating down on me (a desire probably enhanced by the wet, cloudy summer just gone). Many years ago I’d planned a walk from Arches National Monument in Utah for 1,000 miles roughly following the Colorado River. Nothing had come of this plan and since then two Utah hikers had prospected their own 800 mile trail in the same area, which they called the Hayduke Trail, after a character in Edward Abbey’s novel The Monkey Wrench Gang. In 2005 my friend Brian Frankle of ULA Equipment did the first through-hike of the Hayduke Trail, which you can read about on his website here. Musing on the Hayduke Trail, the Arizona Trail and my old plan I started to put together an idea for a long desert hike of my own, combining parts of all three. Just thoughts so far, but exciting ones and that’s where adventures come from. This sounds very interesting Chris. It's great to see the planning process at work - I'll follow this with interest, Perhaps we can also do a podcast on it! Andy, a podcast would be great. Eventually. It's all very tentative at present though. I section-hiked the AZT in 2008-09 and I read, re-read and thoroughly enjoyed your book on the AZT when I was doing my planning for my hike. I look forward to hearing more about your newest desert adventure.